Started out in the sensitized paper business and then branched out into the camera business, creating the first mass production structure for cameras in Japan and driving widespread interest in cameras among consumers. Entered the business machine field as well. Establishes Riken Kankoshi Co., Ltd. (the Ricoh Group commences operations). 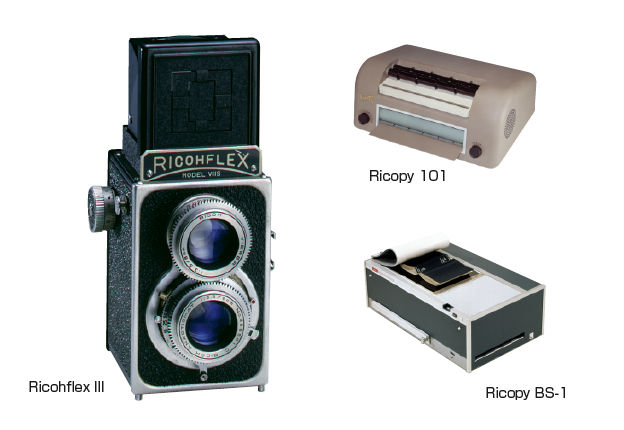 Renames company, Riken Optical Co., Ltd.
Launches the Ricohflex III camera, which spurs the popularization of cameras. Enters the office copier field with the Ricopy 101, its first diazo model. Launches the Ricoh Auto Half, a half-frame camera that proves a massive hit. Establishes Ricoh Industries, U.S.A., Inc., a sales subsidiary. 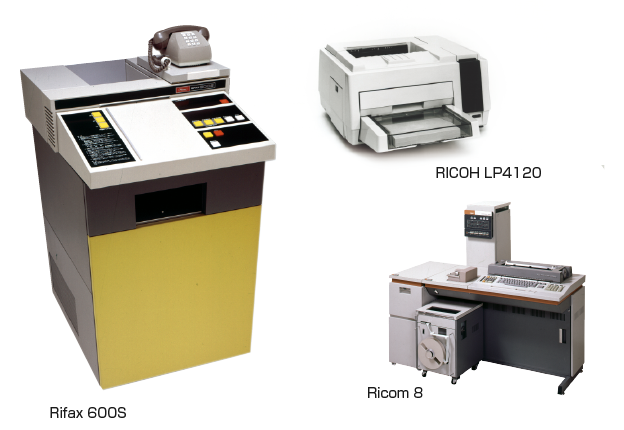 Introduces the Ricopy BS-1, its first electrostatic copier. Launches the Ricomac 201 electric calculator. Industry debut of office automation (OA). Launched various machines, including plain paper copiers (PPC), to support enhanced office productivity. Introduces the Ricom 8, its first office computer. Launches the Ricoh PPC 900, its first dry-electrostatic-transfer plain paper copier. 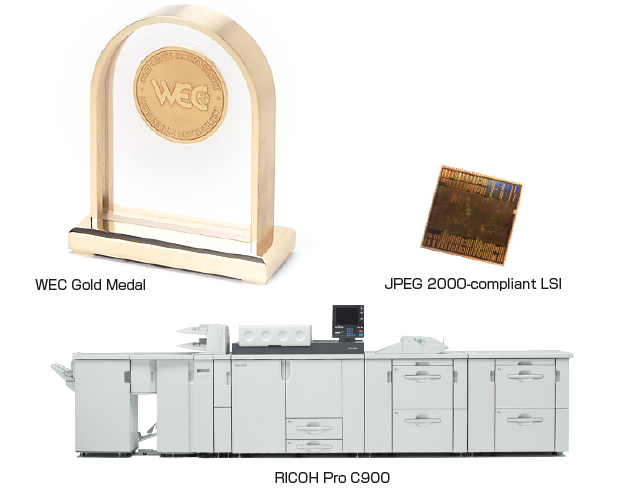 Establishes Ricoh Electronics, Inc., a manufacturing subsidiary in the U.S.
Launches the Rifax 600S, the world’s first high-speed office facsimile machine. Establishes the Environmental Promotion Section. Establishes Ricoh Systems, Inc. in the U.S. to carry out R&D. Introduces Ricoh Thermal Paper Type 110LA for a food POS system. Launches the RICOH LP4120 laser printer. Shifted from analog to digital in the multifunction printer (MFP) domain, helping to popularize digital models. Continued product evolution with the launch of networkable and color-capable models. Launches the IMAGIO 320 digital copier. 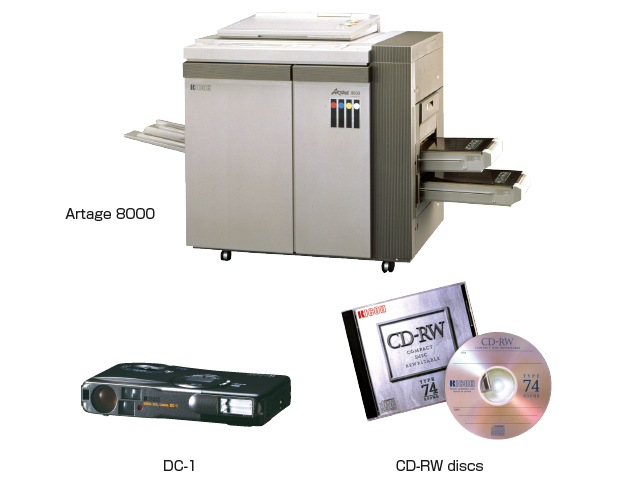 Introduces the Artage 8000 digital color PPC. a manufacturing subsidiary, in China. Implements the Ricoh General Principles on the Environment, obtains ISO 9002 certification. Gotemba Plant obtains the first ISO/DIS 14001 certification from Japan Quality Assurance Organization. Acquires Savin Corporation (U.S.) and Gestetner Corporation (U.K.). Launches the DC-1, its first digital camera. Launches the world’s first CD-Rewritable disc. Introduced a global sales structure and achieved an overseas sales ratio exceeding 50%. Concurrently, as a global company, Ricoh initiated earnest efforts to fulfill corporate social responsibility (CSR) goals, exemplified by the establishment of the CSR Section. Appoints an outside director, introduces the executive officer system. Introduces the world’s first JPEG 2000-compliant LSI, which is capable of processing moving images. Signs the United Nations Global Compact. Establishes the Ricoh Group CSR Charter. Establishes the Ricoh Group Code of Conduct. The Ricoh Group receives a Gold Medal from the World Environment Center (WEC). Acquires Hitachi Printing Solutions, Ltd. Establishes 2050 Long-Term Environmental Vision. InfoPrint Solutions Company, a Ricoh-IBM joint venture, commences operations. Introduces the RICOH Pro C900 color production printer. Acquires IKON Office Solutions, Inc. (U.S.). Establishes the Ricoh Group Biodiversity Policy. 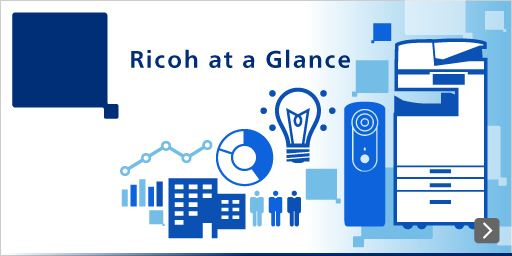 The range of value provided by Ricoh to customers expanded significantly with rapid evolution in customer workstyles. Establishes PENTAX Ricoh Imaging Company, Ltd. Introduces the RICOH PJ WX4130N ultra-short-throw projector. Launches the RICOH Unified Communication System P3000 videoconferencing system. 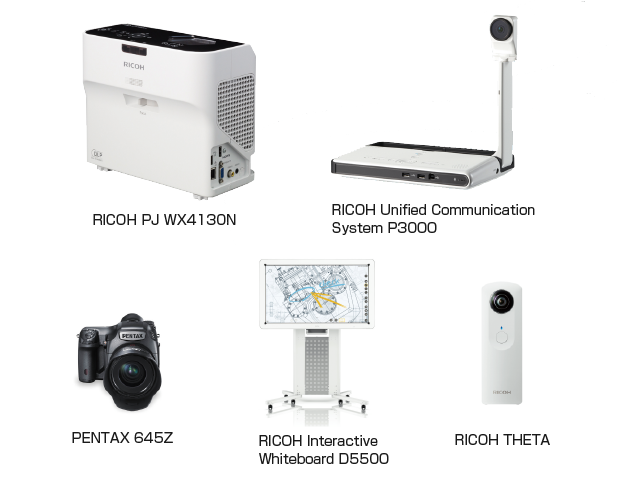 Releases the RICOH Interactive Whiteboard D5500. Launches the RICOH THETA 360° spherical camera. Enters the additive manufacturing business. Opens RICOH Eco Business Development Center. Enters the healthcare solutions field.